The Cold War and internal political factors in Romania have both contributed to Ion Voicu’s neglect in English-speaking countries. The only CD recordings from the violinist’s discography I could find on Amazon is a single release of the Paganini Violin Concerto No. 1 coupled with Sarasate’s Zigeunerweisen on the German Eterna label, from 2003. 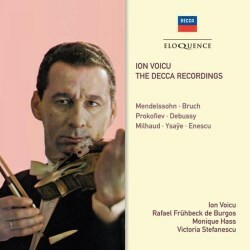 This new release from Eloquence of the Decca Recordings is a lacuna filler that will be enthusiastically embraced by violin fanciers. Voicu was born in Bucharest in 1923, and his initial musical encouragement came from his father who was a violinist. He was dispatched to the local Royal Academy of Music at the age of fourteen, and at sixteen made his debut with the Paganini Violin Concerto No. 1. Starting his career as an orchestral player, his talent was spotted by Willem Mengelberg. With his encouragement Voicu decided to embark on a solo career. It was at his debut performance in 1940 that George Enescu recognized his talents and took him under his wing. In 1954 he travelled to Moscow to study with Abram Yampolsky, who was to die a year later. Voicu then transferred to the class of David Oistrakh. He eventually graduated with first prize, returning to Romania in 1957. Over the next few years he toured, including several trips to the UK. His career also comprised teaching, conducting and jury member. He died in 1997. This selection of Decca recordings were made between 1965 and 1972. The Mendelssohn and Bruch Concertos seem to be made for each other, and have always remained a favoured pairing. The recordings date from 1965, and are two of the finest readings I have ever come across. Nicely paced, Voicu projects a warm, luscious and pure tone. Technically accomplished, they are dispatched with elegance, polish and refinement. Portamenti are tasteful and used sparingly for expressive effect. This is notably so in the lyrical passages of the Bruch. Rafael Frühbeck de Burgos provides admirable support, as he did for Menuhin in the Mendelssohn Concerto six years later in 1971, again with the LSO. The Prokofiev Sonata provides a vehicle for a virtuosic display. Composed in 1943 it shows a certain incongruity between its overall sunny disposition and the terrible events unfolding in Russia at the time of its composition. I’m not at all familiar with the Milhaud Sonata No. 2, Op. 40, but it provides lightweight relief to the selection. There are plenty of attractive melodies to savour. The Debussy is given an idiomatic reading, and Voicu imbues the impressionistic score with many subtle nuances and inflexions. The sonatas are partnered by the French pianist Monique Haas, and the performances are characterful and engaging. The Ysaÿe Solo Sonata is wrongly credited in the booklet and on the CD tray as No. 5 in G major; it is, in fact, No.3 in D minor "To Georges Enesco" that Voicu plays. This is the most popular and frequently performed of the six. Again, the violinist has the technical resources to meet Ysaÿe’s exacting challenges, and his intonation in the double-stop passages is faultless. The remaining works are accompanied by Victoria Stefanescu. The Ravel is given a well-managed performance, with an intoxicating blues movement. It’s a treat to have Enescu’s lesser-known Second Sonata, rather than the more famous third. Not having had many outings in the recording studio, I’ve only heard Enescu’s own recording which he set down in 1943, partnered by the Romanian pianist Dinu Lipatti, sadly in poor sound. Voicu certainly gives it a run for its money, with a freely flowing opening movement, a wistful and melancholic middle movement, topped off with a lively finale. I had always considered it a rather rambling and meandering work, but Voicu seems to give it some cohesion and direction, which has won me over. These recordings are all first releases on CD. The illuminating booklet notes (in English only) are supplied by Tully Potter, who rightly points out that the success of these recordings is due, in part, to the superb acoustics of the two recording venues used by Decca: the Kingsway Hall, London and the Sofiensaal, Vienna. This exciting and varied release should help bring this long-forgotten master back to public awareness. What a find.